Approval of the Minutes of the Commission Meeting Held on August 21, 2017. Report and Vote on the District’s Financial Audit by the Rhode Island Commerce Corporation, Chief Financial Officer, Lisa Lasky and Commission Treasurer Elizabeth Huidekoper. Presentation on the proposed development for Parcel 1A by Gerald and Jack Fandetti of the Kendall Hotel Group (followed by Public Comment). Vote to consider approval of a Level 1 application as submitted by the Kendall Hotel Group for a proposed development on Parcel 1A. 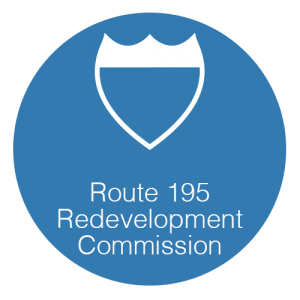 Discussion and Vote to consider the allocation of funds from the I-195 Project Fund as requested by the District for the purposes related to temporary parking on Parcels 27 and 25. Chairperson’s Report/Agenda for next meeting on Monday, October 16, 2017 at 5:00 P.M. If somebody goes, can you take photos of any potential rendering updates? Airport hotel? I think it looks like one of those cruise ships where everyone gets food poisoning. The worst design crime is breaking the street grid. Williams Street and the other little alleyway should extend to the waterfront for pedestrian friendliness and to preserve views from the neighborhood. This mass arrogantly defies its urban context. If this design had much more glass, I think it actually would be pretty cool. It looks like something you’d see in Newport to me. Only difference is coastal destinations would have cedar shake partitions between balconies instead of what is shown here. More glass and this would look like it fits into the city environment better. 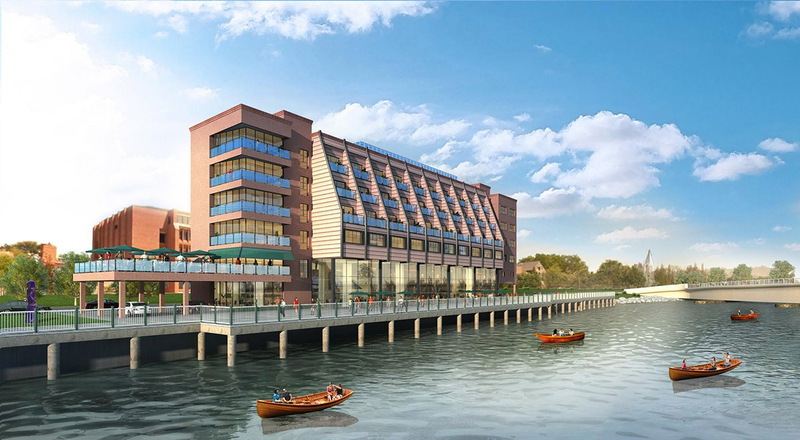 A hotel on the river is a great idea, and I hope that South Street Landing embraces the riverfront with retail and outdoor seating, and event programming. Personally, I’d like to see another hotel on the river on the other side next to South Street Landing. We have like 5 hotels planned or under construction and none of them are luxury hotels. Let’s see something that shiny and pretentious with decent event space, a pool and spa, and use of the river (water shuttles, sightseeing tours, dinner cruises, water sports, boating/sailing, etc.). We have to appeal to that demographic, and yes they do exist. The key is to make the river a focal point of activity and to do that we need development in close proximity. Hotels, restaurants, bars, galleries, retail, etc. located right on the RiverWalk will achieve this. Guests waking up from their water view rooms and having breakfast at a restaurant right on the RiverWalk while people kayak, run, or take a water shuttle to a ferry at India Point Park. It’s a great scene.